This map illustrates satellite-detected water areas as seen by the ASTER sensor acquired on 15 April 2014 as well as a Landsat-8 image acquired on 15 March 2014. The water level inside the tailings pond has increased between 15 March and 15 April 2014. 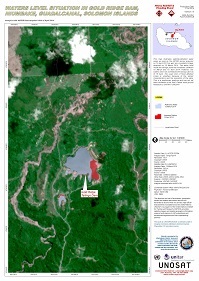 However, the waters have not overflowed the tailings dam as of 15 April. The exact limit of flood affected zones is uncertain because of the sensor characteristics and the resolution of the data. This is a preliminary analysis and has not yet been validated in the field. Please send ground feedback to UNITAR / UNOSAT.